I wrote just yesterday about new evidence showing that decentralized government is more efficient. Part of the reason is because local governments are easier for voters to monitor and more likely to reflect the actual preferences of residents. Another reason is tax competition. It’s relatively easy to “vote with your feet” by moving from one community to another, and this makes it difficult for interest groups and politicians to impose excessive tax burdens. Now we have some serendipity. Two of the readings, by great scholars from the Austrian school of economics, had passages about the importance of decentralization. In 1960, here’s some of what Friedrich Hayek wrote in his classic, The Constitution of Liberty. While it has always been characteristic of those favoring an increase in governmental powers to support maximum concentration of these powers, those mainly concerned with individual liberty have generally advocated decentralization. There are strong reasons why action by local authorities offers the next-best solution…it has many of the advantages of private enterprise and fewer of the dangers of coercive action by government. Competition between local authorities or between larger units within an area where there is freedom of movement…will secure most of the advantages of free growth. Though the majority of individuals may never contemplate a change of residence, there will usually be enough people, especially among the young and more enterprising, to make it necessary for the local authorities to provide as good services at a reasonable costs as their competitors. It is usually the authoritarian planner who…supports the centralist tendencies. I should have remembered that quote from my collection of pro-tax competition statements by Nobel laureates. In any event, I’m glad my memory was refreshed. 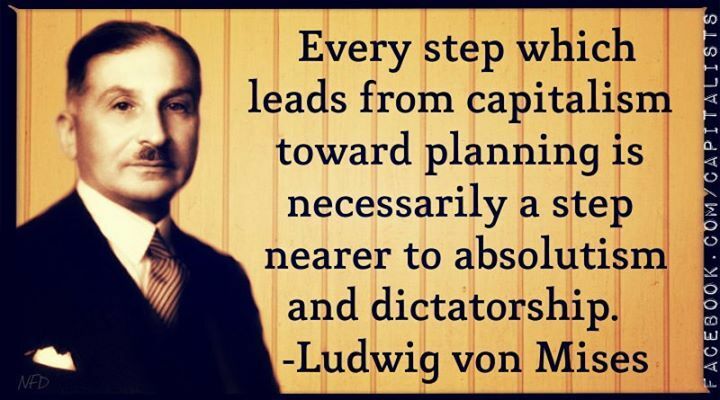 And here’s some of what Ludwig von Mises wrote in his 1944 book, Omnipotent Government. He approached the issue from the opposite direction, explaining that proponents of redistribution needed centralization so their intended victims couldn’t escape by moving across city borders. Every step toward more government interference and toward more planning means at the same time an expansion of the jurisdiction of the central government. …It is a very significant fact that the adversaries of this trend toward more government control describe their opposition as a fight against Washington…against centralization. …This evolution is not accidental. It is the inevitable outcome of policies of interference and planning. …There can be no question of adopting these measure for only one state. It is impossible to raise production costs within a territory not sheltered by trade walls. And remember that there’s academic evidence showing that decentralization limits redistribution. So the statists were smart to oppose welfare reform, since that meant decentralization and less wasteful and counterproductive spending. Just as the statists are smart to push for a nationwide sales tax cartel. And just as the statists are wise to push for an end to international tax competition. All of which means, of course, that the rest of us (at least those of us who value liberty) should follow the wisdom of Hayek and Mises. P.S. Hayek even has groupies. P.P.S. And Hayek even came back to life for Part I and Part II of the Hayek v Keynes rap videos. 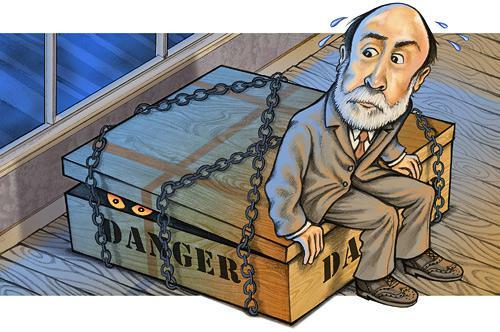 During periods of economic weakness, governments often respond with “loose” monetary policy, which generally means that central banks will take actions that increase liquidity and artificially lower interest rates. I’m not a big fan of this approach. If an economy is suffering from bad fiscal policy or bad regulatory policy, why expect that an easy-money policy will be effective? What if politicians use an easy-money policy as an excuse to postpone or avoid structural reforms that are needed to restore growth? And shouldn’t we worry that an easy-money policy will cause economic damage by triggering systemic price hikes or bubbles? Defenders of central banks and easy money generally respond to such questions by assuring us that QE-type policies are not a substitute or replacement for other reforms. And they tell us the downside risk is overstated because central bankers will have the wisdom to soak up excess liquidity at the right time and raise interest rates at the right moment. I hope they’re right, but my gut instinct is to worry that central bankers are not sufficiently vigilant about the downside risks of easy-money policies. But not all central bankers. While I was in London last week to give a presentation to the State of the Economy conference, I got to hear a speech by Kristin Forbes, a member of the Bank of England’s Monetary Policy Committee. She was refreshingly candid about the possible dangers of the easy-money approach, particularly with regards to artificially low interest rates. Here is one of the charts from her presentation. Those of us who are old enough to remember the 1970s will be concerned about her first point. And this is important. It would be terrible to let the inflation genie out of the bottle, particularly since there may not be a Ronald Reagan-type leader in the future who will do what’s needed to solve such a mess. But today I want to focus on her second, fourth, and fifth points. So here are some of the details from her speech, starting with some analysis of the risk of bubbles. …when interest rates are low, investors may “search for yield” and shift funds to riskier investments that are expected to earn a higher return – from equity markets to high-yield debt markets to emerging markets. This could drive up prices in these other markets and potentially create “bubbles”. This can not only lead to an inefficient allocation of capital, but leave certain investors with more risk than they appreciate. An adjustment in asset prices can bring about losses that are difficult to manage, especially if investments were supported by higher leverage possible due to low rates. If these losses were widespread across an economy, or affected systemically-important institutions, they could create substantial economic disruption. This tendency to assume greater risk when interest rates are low for a sustained period not only occurs for investors, but also within banks, corporations, and broader credit markets. Studies have shown that during periods of monetary expansion, banks tend to soften lending standards and experience an increase in their assessed “riskiness”. There is evidence that the longer an expansion lasts, the greater these effects. Companies also take advantage of periods of low borrowing costs to increase debt issuance. If this occurs during a period of low default rates – as in the past few years – this can further compress borrowing spreads and lead to levels of debt issuance that may be difficult to support when interest rates normalize. There is a lengthy academic literature showing that low interest rates often foster credit booms, an inefficient allocation of capital, banking collapses, and financial crises. This series of risks to the financial system from a period of low interest rates should be taken seriously and carefully monitored. Her fourth and fifth points are particularly important since they show she appreciates the Austrian-school insight that bad monetary policy can distort market signals and lead to malinvestment. Here’s some of what she shared about the fourth point. …is there a chance that a prolonged period of near-zero interest rates is allowing less efficient companies to survive and curtailing the “creative destruction” that is critical to support productivity growth? Or even within existing, profitable companies – could a prolonged period of low borrowing costs reduce their incentive to carefully assess and evaluate investment projects – leading to a less efficient allocation of capital within companies? …For further evidence on this capital misallocation, one could estimate the rate of “scrappage” during the crisis and the level of capital relative to its optimal, steady-state level. Recent BoE work has found tentative evidence of a “capital overhang”, an excess of capital above that judged optimal given current conditions. Usually any such capital overhang falls quickly during a recession as inefficient factories and plants are shut down and new investment slows. The slower reallocation of capital since the crisis could partly be due to low interest rates. And here is some of what she said about the fifth point. 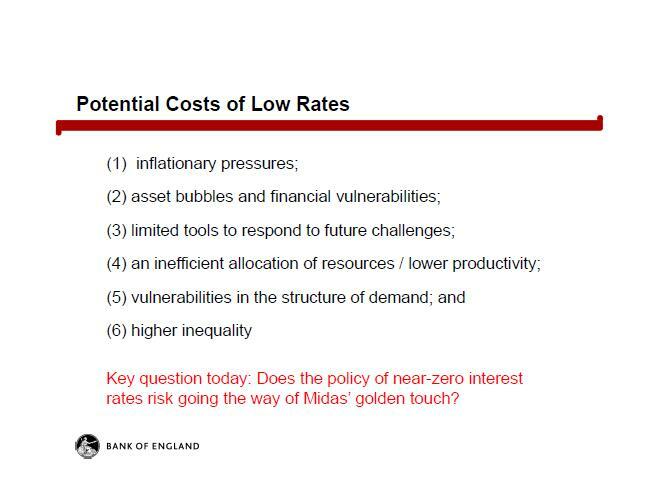 A fifth possible cost of low interest rates is that it could shift the sources of demand in ways which make underlying growth less balanced, less resilient, and less sustainable. This could occur through increases in consumption and debt, and decreases in savings and possibly the current account. …if these shifts are too large – or vulnerabilities related to overconsumption, overborrowing, insufficient savings, or large current account deficits continue for too long – they could create economic challenges. In her speech, Ms. Forbes understandably focused on the current environment and speculated about possible future risks. But the concerns about easy-money policies are not just theoretical. Let’s look at some new research from economists at the Federal Reserve Bank of San Francisco, the University of California, and the University of Bonn. In a study published by the National Bureau of Economic Research, they look at the connections between monetary policy and housing bubbles. How do monetary and credit conditions affect housing booms and busts? Do low interest rates cause households to lever up on mortgages and bid up house prices, thus increasing the risk of financial crisis? And what, if anything, should central banks do about it? Can policy directed at housing and credit conditions, with monetary or macroprudential tools, lead a central bank astray and dangerously deflect it from single- or dual-mandate goals? It appears the answer is yes. This paper analyzes the link between monetary conditions, credit growth, and house prices using data spanning 140 years of modern economic history across 14 advanced economies. …We make three core contributions. First, we discuss long-run trends in mortgage lending, home ownership, and house prices and show that the 20th century has indeed been an era of increasing “bets on the house.” …Second, turning to the cyclical fluctuations of lending and house prices we use novel instrumental variable local projection methods to show that throughout history loose monetary conditions were closely associated with an upsurge in real estate lending and house prices. …Third, we also expose a close link between mortgage credit and house price booms on the one hand, and financial crises on the other. Over the past 140 years of modern macroeconomic history, mortgage booms and house price bubbles have been closely associated with a higher likelihood of a financial crisis. This association is more noticeable in the post-WW2 era, which was marked by the democratization of leverage through housing finance. In other words, we’re still dealing with some of the fallout of a housing bubble/financial crisis caused in part by the Fed’s easy-money policy last decade. Yet we have people in Washington who haven’t learned a thing and want to repeat the mistakes that created that mess. Even though we now have good evidence about the downside risk of easy money and bubbles! Sort of makes you wonder whether the End-the-Fed people have a good point. P.S. Central banks also can cause problems because of their regulatory powers. P.P.S. Just as there are people in Washington who want to double down on failure, there are similar people in Europe who think a more-of-the-same approach is the right cure for the problems caused in part by a some-of-the-same approach. P.P.P.S. For those interested in monetary policy, the good news is that the Cato Institute recently announced the formation of the Center for Monetary and Financial Alternatives, led by former UGA economics professor George Selgin, which will focus on development of policy recommendations that will create a more free-market monetary system. P.P.P.P.S. If you watch this video, you’ll see that George doesn’t give the Federal Reserve a very high grade. Keynesian economics is a failure. It didn’t work for Hoover and Roosevelt in the 1930s. It didn’t work for Japan in the 1990s. And it didn’t work for Bush or Obama in recent years. No matter where’s it’s been tried, it’s been a flop. So why, whenever there’s a downturn, do politicians resuscitate the idea that bigger government will “stimulate” the economy? I’ve tried to answer that question. Keynesian economics is the perpetual motion machine of the left. You build a model that assumes government spending is good for the economy and you assume that there are zero costs when the government diverts money from the private sector. …politicians love Keynesian theory because it tells them that their vice is a virtue. They’re not buying votes with other people’s money, they’re “stimulating” the economy! I think there’s a lot of truth in that excerpt, but Sheldon Richman, writing for Reason, offers a more complete analysis. He starts by identifying the quandary. You can’t watch a news program without hearing pundits analyze economic conditions in orthodox Keynesian terms, even if they don’t realize that’s what they’re doing. …What accounts for this staying power? He then gives his answer, which is the same as mine. I’d have said it’s because Keynesianism gives intellectual cover for what politicians would want to do anyway: borrow, spend, and create money. They did these things before Lord Keynes published his The General Theory of Employment, Interest, and Money in 1936, and they wanted to continue doing those things even when trouble came of it. But then Sheldon digs deeper, citing the work of Professor Larry White of George Mason University, and suggests that Keynesianism is popular because it provides hope for an easy answer. Lawrence H. White of George Mason University, offers a different reason for this staying power in his instructive 2012 book The Clash of Economic Ideas: The Great Policy Debates and Experiments of the Last Hundred Years: namely, that Keynes’s alleged solution to the Great Depression offered hope, apparently unlike its alternatives. …White also notes that “Milton Friedman, looking back in a 1996 interview, essentially agreed [that the alternatives to Keynesianism promised only a better distant future]. Academic economists had flocked to Keynes because he offered a faster way out of the depression, as contrasted to the ‘gloomy’ prescription of [F.A.] Hayek and [Lionel] Robbins that we must wait for the economy to self-correct.” …Note that the concern was not with what would put the economy on a long-term sustainable path, but rather with what would give the short-term appearance of improvement. In other words, Keynesian economics is like a magical weight-loss pill. Some people simply want to believe it works. Which is understandably more attractive than the gloomy notion the economy has to go through a painful adjustment process. But perhaps the best insight in Sheldon’s article is that painful adjustment processes wouldn’t be necessary if politicians didn’t make mistakes in the first place! A related aspect of the Keynesian response to the Great Depression—this also carries on to the current day—is the stunning lack of interest in what causes hard times. Modern Keynesians such as Paul Krugman praise Keynes for not concerning himself with why the economy fell into depression in the first place. All that mattered was ending it. …White quotes Krugman, who faulted economists who “believed that the crucial thing was to explain the economy’s dynamics, to explain why booms are followed by busts.” …why would you want to get bogged down trying to understand what actually caused the mass unemployment? It’s not as though the cause could be expected to shed light on the remedy. 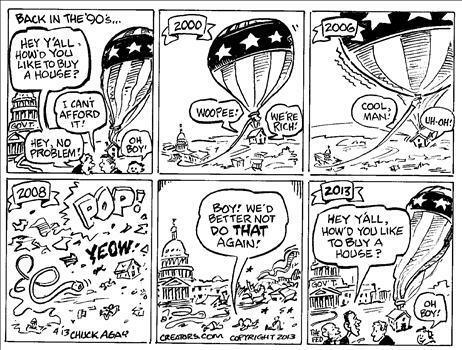 This is why it’s important to avoid unsustainable booms, such as the government-caused housing bubble and easy-money policy from last decade. Hayek, Robbins, and Mises, in contrast to Keynes, could explain the initial downturn in terms of the malinvestment induced by the central bank’s creation of money and its low-interest-rate policies during the 1920s. …you’d want to see the mistaken investments liquidated so that ever-scarce resources could be realigned according to consumer demand… And you’d want the harmful government policies that set the boom-bust cycle in motion to end. Gee, what a radical notion. Instead of putting your hope in a gimmicky weight-loss pill, simply avoid getting too heavy in the first place. P.S. Here’s some clever humor about Keynesian economics. P.P.S. If you like humor, but also want some substance, here’s the famous video showing the Keynes v. Hayek rap contest, followed by the equally entertaining sequel, which features a boxing match between Keynes and Hayek. And even though it’s not the right time of year, this satirical commercial for Keynesian Christmas carols is right on the mark. I had the gall to share a video yesterday of me lecturing for an hour about the economics of public policy (followed by another hour of Q&A). Though I also included this link to a six-minute video on the same topic for folks who just wanted to skim the surface. Well, for those who like detailed expositions, here’s a video giving the Austrian school’s view of macroeconomics. In the past, I’ve only briefly addressed Austrian theory, linking once to a deliberate argument for Austria economics by Robert Higgs and once to an unintentional argument for the Austrian school by Robert Samuelson. This video will eat up about one hour of your day, but it will be time well spent. It’s a thorough explanation showing why the Austrian school offers the best insight about how a real-world economy operates. P.S. If you want an Austrian-based critique of the Federal Reserve, this George Selgin video will give you everything you could possibly want. 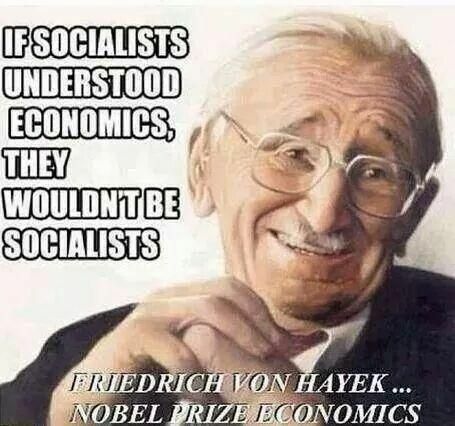 The video was produced by John Papola, who was one of the creators of the famous Hayek v Keynes rap video, as well as its equally clever sequel. I’ve written several times about Hoover and Roosevelt causing/deepening/lengthening the Great Depression with their tax-and-spend, interventionist policies (see here, here, here, here, here, here, and here). But I’ve only once waded into the deeper economic issues. But a new column by Robert Higgs (h/t, Don Boudreaux) has motivated me to give some well-deserved attention to Austrian economic theory. As you can see in the excerpt below, Higgs succinctly explains that understanding the works of scholars such as Hayek and Mises is necessary if we want people to truly understand why Keynesianism doesn’t work. Higgs also cites two excellent articles (here and here) by my former grad school colleague, Steve Horwitz, for those who want a head start on grasping these issues. Misunderstanding the Great Depression has caused much mischief in modern macroeconomics and, more important, in government fiscal and monetary policies based on or influenced by this faulty understanding. If we are ever to arrive at a sound understanding of the Depression, we will have to persuade the economics profession to take Austrian economics seriously, as most economists did before the publication of Keynes’s magnum opus in 1936. Keynesianism in particular has proven itself to be a fundamentally flawed mode of analysis, yet one that has survived, evolved, and—like the zombies in the film “Night of the Living Dead”—keeps coming back, no matter how many times anti-Keynesians credit themselves with having dealt it a fatal blow. Monetarist, New Classical, and other recent critiques have themselves been inadequate or indefensible in various ways, as well.